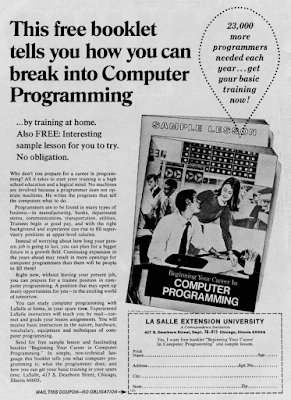 Last week I found a piece of advertisement I found very funny: it was an ad telling readers 23K more programmers were needed each year... and of course becoming one of them was a good idea! The ad dates back from 1971 and I found it in a very old comic book. I think it is quite nice finding such a reading! "I think it is quite funny that you should understate the niceness of such a find, while you publish it on your own blog"